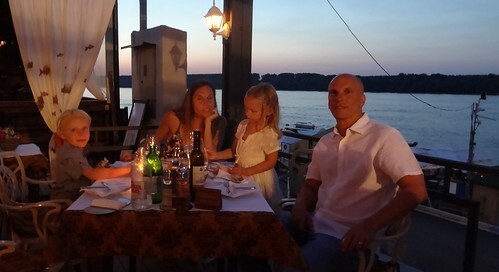 Dinner Along the Danube, originally uploaded by bill kralovec. 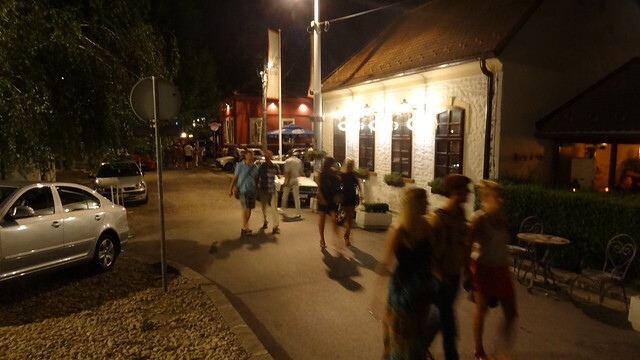 We went out to eat last night at the restaurant Šaran on the Zemun Quay. It was such a pleasant experience, I had to blog about it. Zemun used to a separate city from Belgrade, but is now one of the 17 municipalities of Belgrade. It has a slightly different feel (architecture) than Belgrade, being under the Austrian-Hungarian Empire influence for a long time. Zemun was founded on the banks of the Danube River, on three hills. There is a nice riverfront area of restaurants, that with a few modifications, could be made even nicer, and perhaps another attraction like Kalamegdan or St. Sava’s Church. There are quaintly, slightly decrepit buildings, small fisherman’s boats, cobblestones, trees, and breeze coming off the river, with the view of a green opposite bank. One feels like it could be a Greek island waterfront, or a neighborhood of Venice. There were old men sitting on tables in front of dimly lit cafes, having a drink and some laughs. The restaurants in the summer have temporary dining areas along the river, outside of their main buildings. Many have live music. Besides diners and cafe-goers, there were families going for a walk along the quay, fishermen coming back from a day on the river, etc. It is perhaps a bit like San Francisco’s Fishermen’s Wharf before it became a tourist trap. They can improve the area by stopping cars from entering the cobblestone street along side the quay. There are several areas nearby that could be developed as parking areas. We saw they were improving the walking paths along the quay and this would also help, especially if they can figure out a walking path up to the Gardoš Tower, which is a short two blocks from the river. There are also potential green areas further up the river bank that could be included in the quay area. Further down river there is the Grand Casino, more riverside parks, Great War Islands, with Lido Beach, and many great “splavs” – restaurants and night clubs on stillts on the river – also close by and with some creative development, could be connected to the Zemun Quay. It could be a good alternative to the downtown Bohemian Restaurant district of Skadarlija. The food was good at Šaran and we had the best waiter I’ve encountered in Belgrade, Some of the dishes were a bit over-salted for our taste, but overall a fantastic meal.